This afternoon I'm spending a little time catching up with computer things and not rushing around quite so crazily as most days of late. 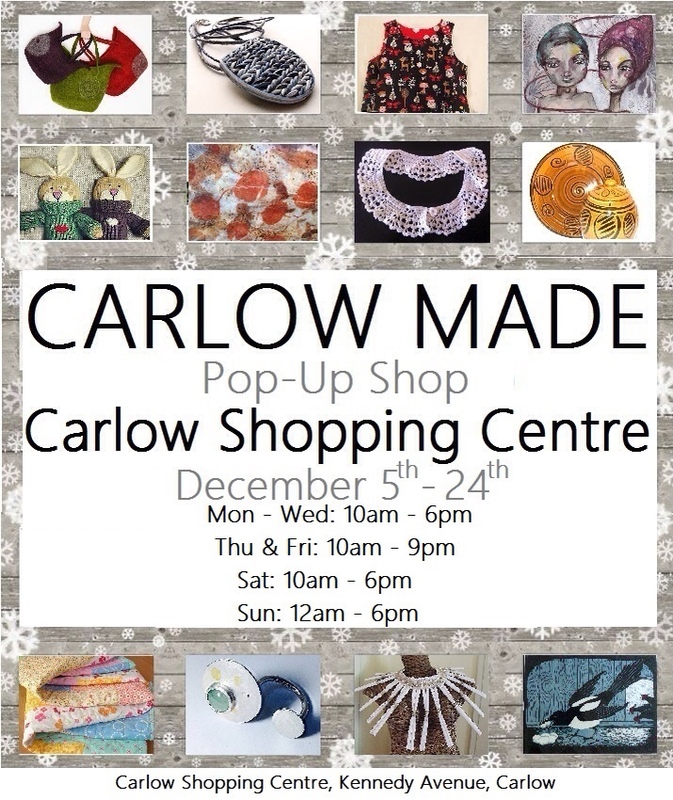 Yesterday I had my first stint manning the 'Carlow Made' pop up shop with Ornat, the shopping centre was actually very quiet considering it's so near Christmas but our group collaboratively had a good day sales wise. I'm not trying to force my work on any of you but if you are considering buying a naturally printed scarf, wall hanging/rug/runner or cushion/pillow for a stylish Irish made Christmas present please don't leave it too late! I sold three naturally printed silk scarves at Borris Food & Craft Market this morning so the scarves that are currently in the pop up shop are the only ones now available until I finish another batch. I have about five waiting to be washed out and ironed, whether I get these finished before Christmas is anyone's guess at present, just saying, if you want one or two (complete with their tagged gift boxes) get them sooner rather than later!!! I'm uploading this picture too just to let you know the position in the shop where my scarves are hanging. Friend and fellow 'Carlow Made' participant Catherine Sothern is also selling naturally printed work (FB fans may remember pics from a workshop at Casheen where I shared the technique! ), Catherine's scarves are in front of her lovely cushions and vintage inspired hats while mine are opposite the shelves with the rest of my felt and printing. Do let me know if you're coming in and want a chat or a bit of personalised help, I'll be in Carlow most days in the run up to Christmas Eve but obviously I'll be working from home a lot too! 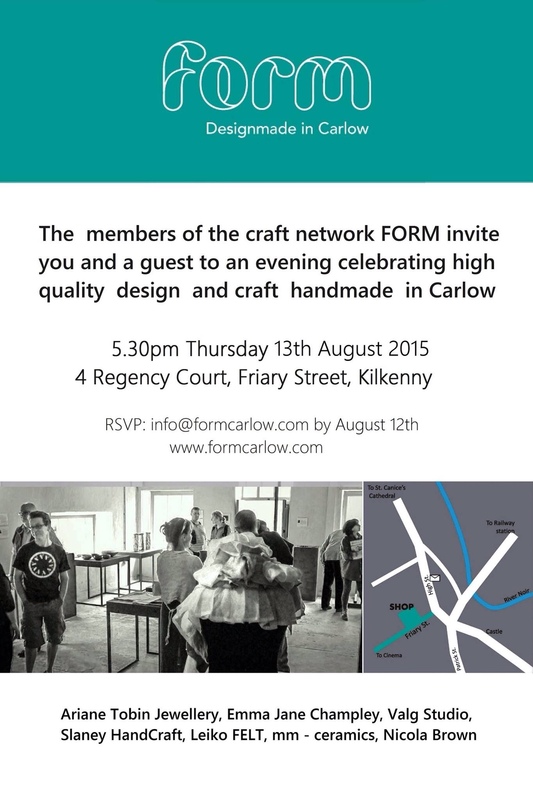 Felting completed, printing tomorrow, ‘Carlow Made’ pop up shop open for business! 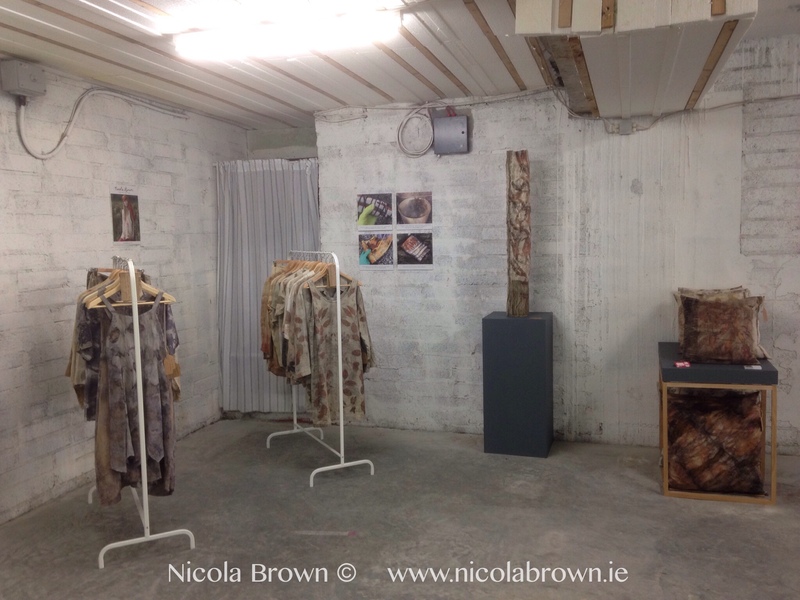 I've felted three white wraps working from the now calm and tidy refitted studio, tomorrow I've a full day of natural printing on the cards then Sunday sees the frenzy of the annual Duckett's Grove Christmas Fair, my last day at the DG studio until early in 2014. 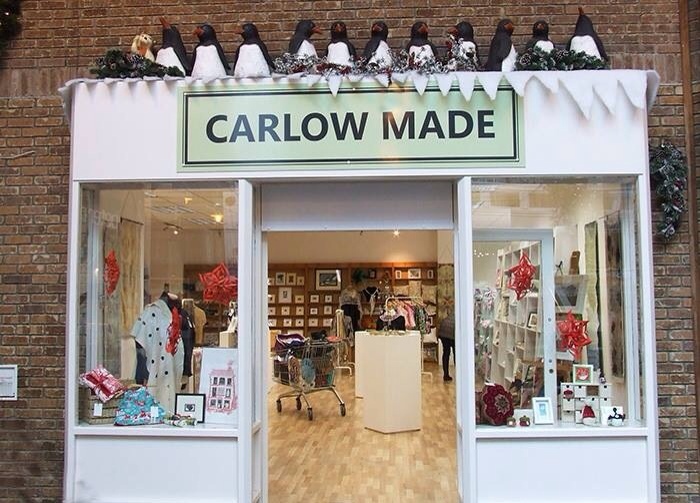 As you may realise there's not much time left spare currently to write very much, I will however share some photos from the 'Carlow Made' pop up shop which is now open for business, it's starting to feel pretty festive around here at last! Thanks Carlow Enterprise Board for organising our signage in time for our first day of trading yesterday, I think that the shop looks pretty welcoming, don't you? Liga and Catherine having fun on the first of the setting up days, our location slap bang in the middle of Carlow (Superquinn) Shopping Centre couldn't really be any more central! 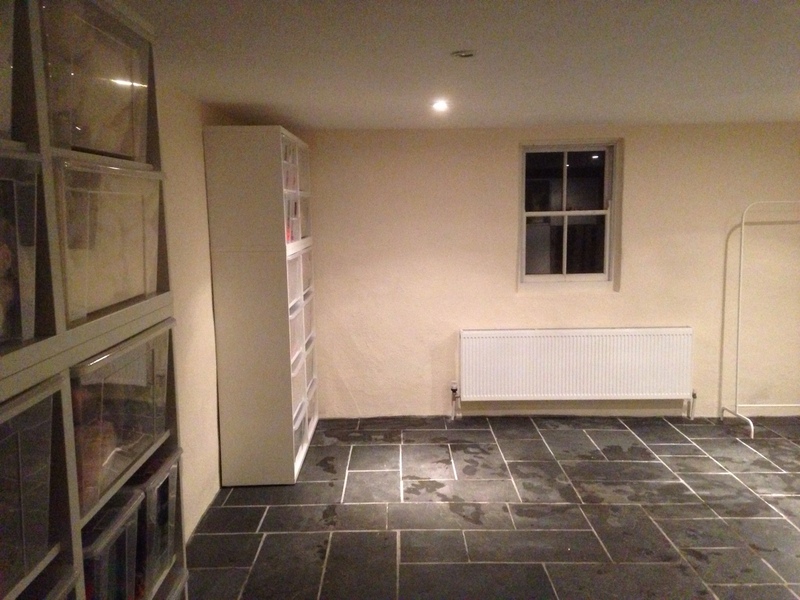 This last picture was assembled using autostitch, sorry if there is a bit of a blur where two photos have been joined together! 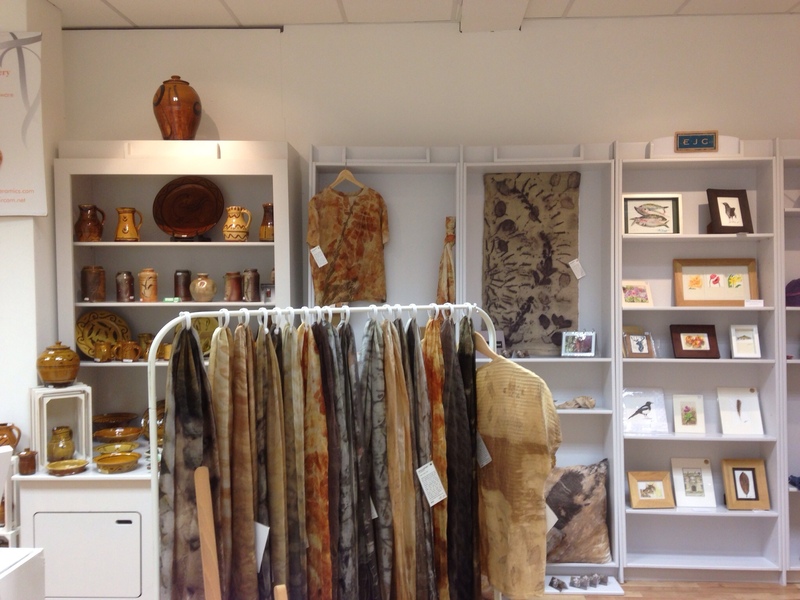 From the left, Emma's jewellery, my naturally printed wall hanging/rug, Jim's ceramics, my felt, naturally printed silk homewares and accessories, Emma's paintings and Ilona's own designed and knitted hats, scarfs and cowls. Do call in if you're in Carlow town any day, we're there during the centre opening hours right up until Christmas Eve, late opening until 9pm every Thursday and Friday! You can also keep an eye on our activities on Facebook, don't forget to shout out loud if you see anything that you'd like to buy.